The television has been the centerpiece in a majority of homes since its invention back in the 1920s; a long time for it to evolve too. Skip almost a century and still, it is perhaps the first thing we glue our eyes and focus our attention on the moment we walk into the house. If you’re ahead of the curve then you’ve certainly heard about the MAGICSEE N5 Android TV OS TV Box. If not, you’re in luck – step into the future of television with a device guaranteed to turn the TV business upside down. We’ve all regretted paying premium subscriptions just to watch repeating content on digital satellite networks; stuff that’s never near the latest after all. You don’t have to continue spewing your hard earned money towards this needless ritual, not if you own an OS TV Box. Let us explain why before diving into our experience with the MAGICSEE N5 Android TV in particular. DST (Digital Satellite Television) was the in-thing before the internet ruined its chances for a space in the future (now). The advent of entertainment-on-demand broke the entire concept on which the pay-to-watch television entertainment model hinged on. 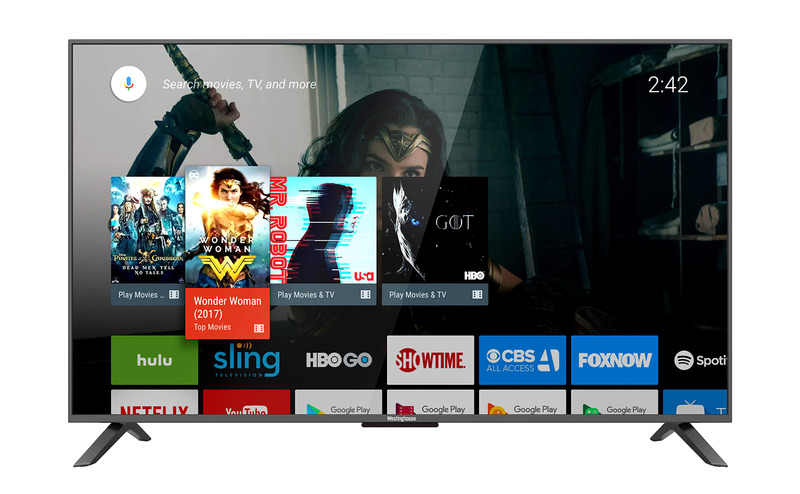 TV Boxes like the MAGICSEE N5 Android TV OS TV Box mean that you never have to wait one week between your favorite show episodes – you may as well binge. Most importantly, the cost of running a fully stocked DST service is exorbitant, to say the least. Compared to the price asked of you by streaming services such as Netflix, it’s a no-brainer. With the majority of us have stuck with the DST entertainment model, even our team received the new concept with some traces of skepticism. Questions had to be answered. Those streaming on their laptops couldn’t see the point. Others just had too much inertia to change from the pricier DST model. After a few days in, these were our observations. Once the easy setup process was done; connecting the power and HDMI cables that come with the box, it was down to business. Testing. 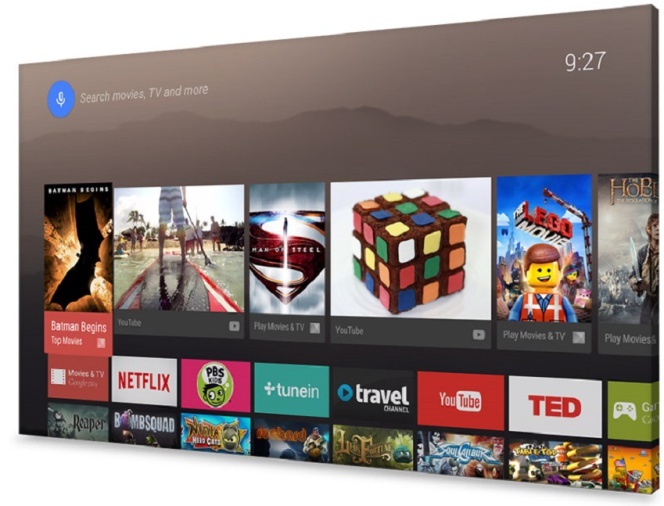 Even when new to the OS TV concept, any Android user immediately feels at home with the interface and system mechanics. Think of it as turning your TV into an Android device. Even the regular flat screen TV (Not Smart TV) morphs into a really intelligent device at the snap of a finger. Well, the press of the remote button really. Imagine the savings on that upgrade! 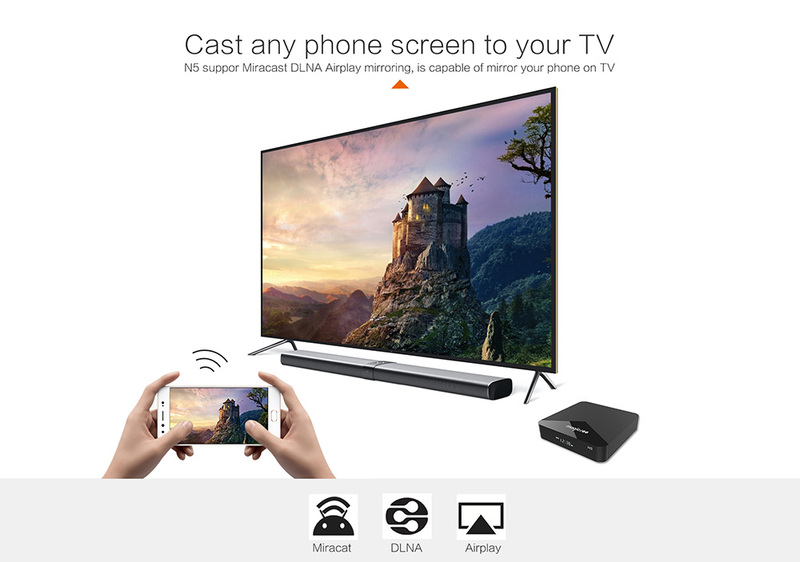 To fully evaluate the entertainment value of the MAGICSEE N5 Android TV OS TV Box, consider the possibilities that immediately become open the moment you plug it to your TV set. 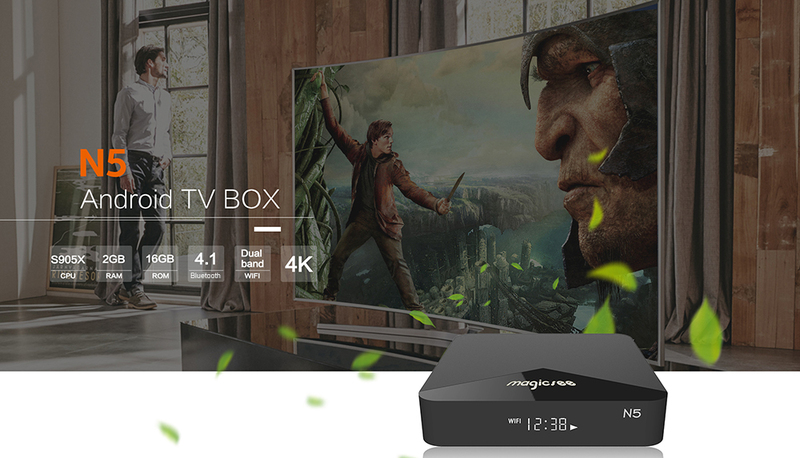 The MAGICSEE N5 Android TV OS TV Box will easily become the perfect companion for sports fans. They can stream live games through the millions of apps available from the Google Play Store, participate in fantasy leagues, and immerse themselves fully in their favorite teams’ news whenever they want. It’s all at their fingertips. No more waiting for the DST schedule for updates. Ever noticed how some of the best game titles are only available on the mobile platform? With the MAGICSEE N5 Android TV OS TV Box allows you to play these from the significantly larger screen that is your TV set. Imagine the new strategies you’ll be able to conjure up just because you see more area of the game in detail compared to when you’re slouched down towards your phone. 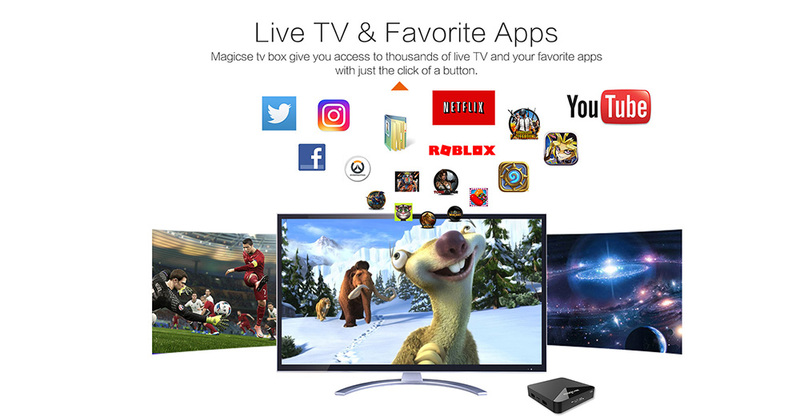 If you think your social media experience is exciting on the smartphone, wait till you experience it through the MAGICSEE N5 Android TV OS TV Box. With apps specially made to give you a better communication experience with your friends through the Television, chatting never felt as good as on the TV. Consider multiple windows open on the big screen; smiles all day, right? 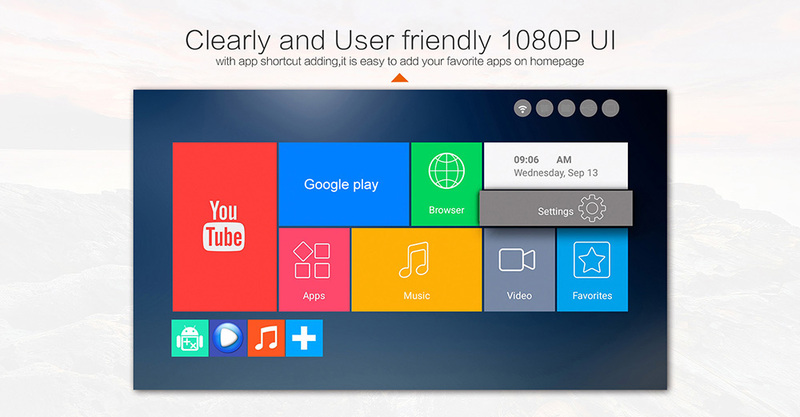 Let’s get into how the MAGICSEE N5 Android TV OS TV Box does all this and more. The best way to explain how all the functionality comes to being is if you consider is just as you would any other minicomputer or a portable home server. Except it was designed and manufactured for entertainment purposes – mainly(it does the other things computers do too). The Amlogic S905X Central Processing Unit houses one of the best entertainment dual-core processors on the market. Allowing you to perform a plethora of activities concurrently before negotiating performance. Add to that some 2Gb of Random Access Memory and 16Gb of onboard storage memory (expandable up to 64Gb) to store content locally for those moments when your connection is acting up. Being mainly used to stream content, we wouldn’t blame you for expecting the best picture quality from the MAGICSEE N5 Android TV OS TV Box. It delivers on that expectation satisfactorily. Because the internet inevitably provides different video formats, at different qualities, the MAGICSEE N5 Android TV adjusts accordingly. 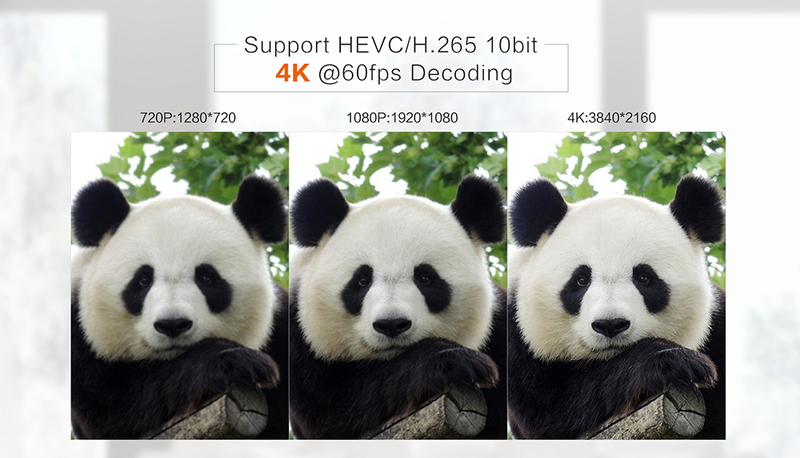 It supports low-quality video streaming as well as 4K videos at a jaw-dropping 3840 x 2160 pixel resolution. Because the Android Operating system was primarily developed for mobile and handheld devices, a lot of us expected sluggish performance once it moves to the big screen. We were shocked at how smooth the remote works as a pointer picking the apps we wanted to open, and seeing them respond so well. The MAGICSEE N5 Android TV OS TV Box runs on the latest Android version for large screens version 7, which opens it up to a lot of exciting apps for you to explore and enjoy. Through the internet connection (wifi or wired), users can easily link their devices with their TVs to extend the mobile experience on to wider viewport. That’s a great feature for gamers and movie fans alike. Even editing documents makes a lot of sense doing on the bigger screen and reduces strain on the eyes. Even with the pictures already shown above, let’s get into the various ports available on the MAGICSEE N5 Android TV OS TV Box. Standard USB x 2, HDMI, DC input, and AV connection ports are visible on the sides of the device. In addition to these are the Ethernet LAN port for a wired internet cable, TF Card slot to extend the onboard memory capacity – not that you have to though, and the SPDIF port for sound output to a high-quality sound decoder for the complete home entertainment experience. It presents a lot of entertainment value. Supports a very wide range of file format for both video and sound. It is an inexpensive entertainment solution for the whole family. Very easy to setup and use. Barely have to refer to the manual. The memory is small, 64Gb max nowadays means a few locally stored files. 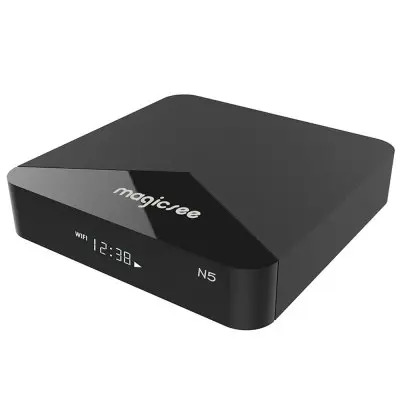 There are many OS TV Boxes on the market today (date of publishing), but the MAGICSEE N5 Android TV OS TV Box is perhaps the best priced among the lot. There are very few things that will matter when considering home entertainment; picture quality is not one of those because we’re soon going to be streaming – and only the best will do. Among those that matter will be usability, what with more apps landing on the scene. The way our test with the MAGICSEE N5 Android TV OS TV Box was easy to commence alone tells a lot about its future on the market. DST is dying, fast. For that, owning the line of products manufactured by such visionaries today makes so much more sense than forking your money towards the DST dying giants.